The San Bernard River snakes around River’s End village and exits to the left in the photo toward the Gulf. 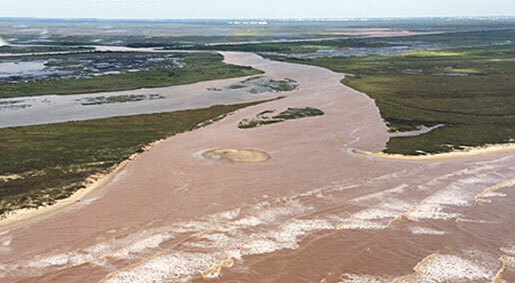 The murky plume of brownish silt is from the flooding Brazos River that is flowing into the Intracoastal Waterway and backing up to just below River’s End. The ICW is seen making a dog-leg turn in the upper left of the photo with Cedar Lakes to the left of it next to the Gulf. River's End is located a mile above the intersection of the ICW and the river and two miles above the mouth and the Gulf of Mexico. Yesterday Oct 21st, at high tide (approximately 2.5 ft MSL), the mouth of the San Bernard was open only near the west bank where a channel of some kind (depth unknown) opened to the Gulf. The sand bar that's normally exposed and partially crosses the mouth from east to west, has a few inches of water flowing over it giving the impression that the mouth is completely open from bank to bank. It's not, only along the west bank where there is a channel open to the Gulf.